Individuals and families who are confronted by U.S. Immigration and Customs Enforcement (ICE) or traumatized by local law enforcement may now call (317) 759-9474 and receive on-site support from trained rapid-response leaders within five minutes of the call. Rapid responders act as moral and legal observers, while accompaniment teams will connect impacted families to legal and social services and work with them to determine an appropriate public response. Rapid responders will capture incident data, record video stories and document real-time reports that will be used to identify patterns over time and arm communities of color with the evidence needed to encourage policy change among public officials. Faith in Indiana is working to prepare up to 450 leaders in multiple roles to work the hotline, including dispatchers, rapid responders, accompaniment teams, sanctuary hosts, trainers and more. Save (317) 759-9474 in your phone! ECONOMIC DIGNITY: Raised $56 million annually to expand transit and create 45,000 new jobs. CRIMINAL JUSTICE REFORM: Money bail see the beginning of the end in Indiana. More to come! 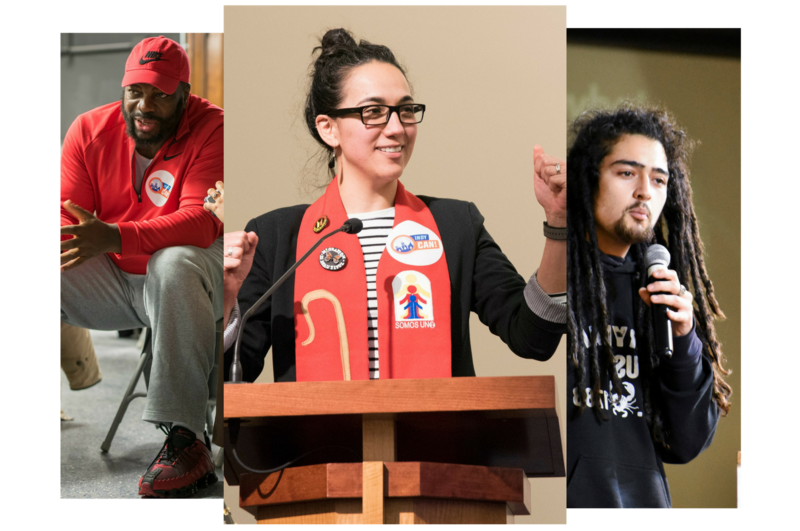 PROPHETIC VOICE GROWS: In a historic gathering of faith leaders across race, faith, and geography in Indiana launch a Moral Agenda backed by political muscle. Pledge to activate tens of thousands of ‘Prophetic Voters’ to hold candidates and elected officials accountable to divest in incarceration and invest in families ahead of the 2018 Mid-term Agenda. Join the movement register for founding convention. LIVE FREE: One Month without a Homicide on City’s Eastside – LIVE FREE celebrates a dramatic shift as a result of pilot project and continues to work with city leaders to scale up Group Violence Intervention strategy that has led to dramatic drops in homicides in cities across the country by putting in place a path out of street life for the handful of active people engaged in gun violence. Through constant communication with tens of thousands of people from more than 20 member congregations across Central Indiana, Faith in Indiana is deeply rooted in the stories of our people and our shared faith values. By staying connected together, we expand the human capacity to make measurable systemic change. We’ve talked to 10,000 voters and will talk to 100,000 more before the 2020 election. Connect with us to participate in our upcoming voter engagement work! Our leaders/members connect community organizations with civic and political leaders. Together, we create systemic change. Through tens of thousands of people from more than 20 member congregations we are deeply rooted in the stories of our people and our shared faith values. Click here to view congregations. We are an organized movement of people of faith building strong partnerships with public officials and policy makers who impact long-term change. Our community is growing and we thank you for being a part of it, whether here on our website or on our other social media platforms. Click here to connect with us on Facebook. Click here to connect with us on Twitter. Schedule a 1-1 meeting or discuss how you wish to make change in your community by reaching out and connecting with our team of organizers. Click here to connect with Faith in Indiana staff members.